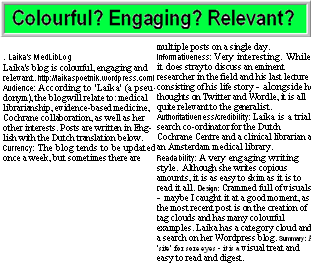 The host of Next Grand Rounds (Pallimed) asked to submit a recent blog post from another blogger in addition to your own post. I choose “Orthostatics – one more time” from DB Medical rants and a post commenting on that from Musings of a Dinosaur. Bob Center’s (@medrants) posts was about the value of orthostatic vital sign measurements (I won’t go into any details here), and about who should be doing them, nurses or doctors. 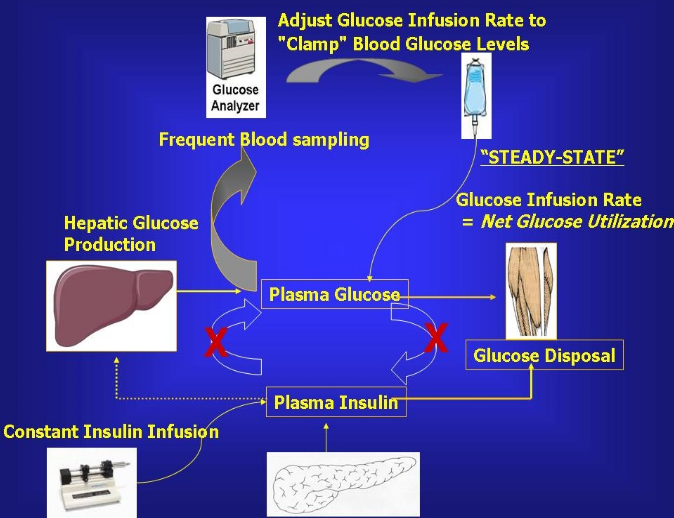 In his post, Bob Center also mentioned briefly that students were seeing this as scut work similar as drawing your own bloods and carrying them to the lab. That reminded me of something that happened when I was working in the lab as a PhD, 20 years ago. The t(14;18) is THE hallmark of follicular lymphoma (lymphoma is a B cell cancer of the lymph nodes). 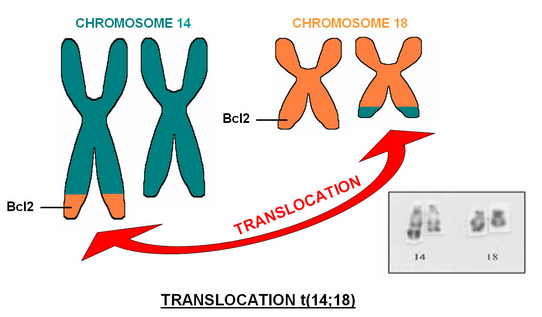 This chromosomal translocation is caused by a faulty coupling of an immunoglobulin chain to the BCL-2 proto-oncogene during the normal rearrangement process of the immunoglobulins in the pre-B-cells. This t(14;18) translocation can be detected by genetic techniques, such as PCR. Using PCR, we found that the t(14:18) translocation was not only present in follicular lymphoma, but also in benign hyperplasia of tonsils and lymph nodes in otherwise healthy persons. Just one out of 1 : 100,000 cells were positive. When I finally succeeded in sequencing the PCR-amplified breakpoints, we could show that each breakpoint was unique and not due to contamination of our positive control (read my posts on XMRV to see why this is important). So we had a paper. Together with experiments in transgenic mice, our results hinted that t(14;18) translocations is necessary but not sufficient for follicular lymphoma. Enhanced expression of BCL-2 might give make the cells with the translocation “immortal”. All fine, but hyperplastic tonsils might still form an exception, since they are not completely normal. We reasoned that if the t(14;18) was an accidental mistake in pre B cells it might sometimes be found in normal B cells in the blood too. But then we needed normal blood from healthy individuals. At the blood bank we could only get pooled blood at that time. But that wasn’t suitable, because if a translocation was present in one individual it would be diluted with the blood of the others. So, as was quite common then, we asked our colleagues to donate some blood. The entire procedure was cumbersome: a technician first had to enrich for T and B cells, we had to separate the cells by FACS and I would then PCR and sequence them. The PCR and sequencing techniques had to be adopted, because the frequency of positive cells was lower than in the tonsils and approached the detection limit. ….. That is in most people. But not in all. One of our colleagues had relatively prominent bands, and several breakpoints. It was explained to him that this meant nothing really. Because we did find similar translocations in every healthy person. But still, I wouldn’t feel 100% sure, if so many of my blood cells (one out of 1000 or 10.000) contained t(14:18) translocations. He was one of the first volunteers we tested, but from then on it was decided to test only anonymous persons. Does the NHI/FDA Paper Confirm XMRV in CFS? Well, Ditch the MR and Scratch the X… and… you’ve got MLV. The long awaited paper that would ‘solve’ the controversies about the presence of Xenotropic Murine Leukemia Virus-related virus (XMRV) in patients with chronic fatigue syndrome (CFS) was finally published in PNAS last week . The study, a joint effort of the NIH and the FDA, was withheld, on request of the authors , because it contradicted the results of another study performed by the CDC. Both studies were put on hold. The CDC study was published in Retrovirology online July 1 . It was the fourth study in succession [4,5,6] and the first US study, that failed to demonstrate XMRV since researchers of the US Whittemore Peterson Institute (WPI) had published their controversial paper regarding the presence of XMRV in CFS . The WPI-study had several flaws, but so had the negative papers: these had tested a less rigorously defined CFS-population, had used old and/or too few samples (discussed in two previous posts here and here). In a way, negative studies, failing to reproduce a finding, are less convincing then positive studies. Thus everyone was eagerly looking forward to the release of the PNAS-paper, especially because the grapevine whispered this study was to confirm the original WPI findings. Indeed after publication, both Harvey Alter, the team leader of the NIH/FDA study, and Judy Mikovitz of the WPI emphasized that the PNAS paper essentially confirmed the presence of XMRV in CFS. But that isn’t true. Not one single XMRV-sequence was found. Instead related MLV-sequences were detected. Before I go into further details, please have a look at the previous posts if you are not familiar with the technical details , like the PCR-technique. 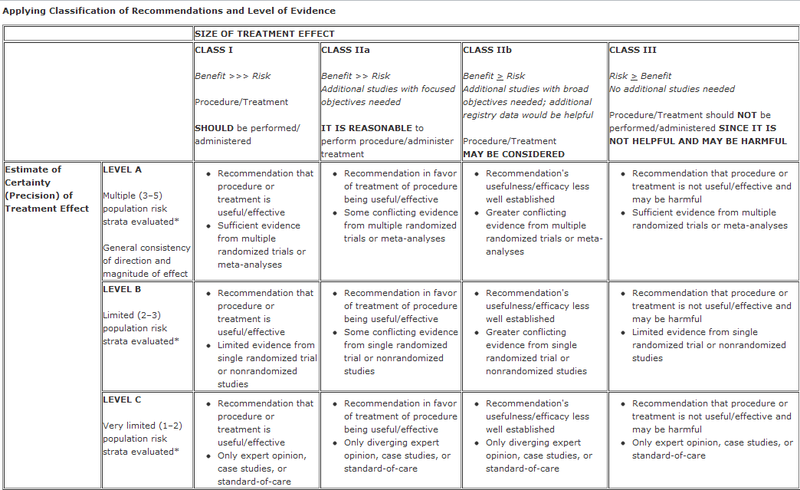 Here (and in a separate spreadsheet) I also describe the experimental differences between the studies. 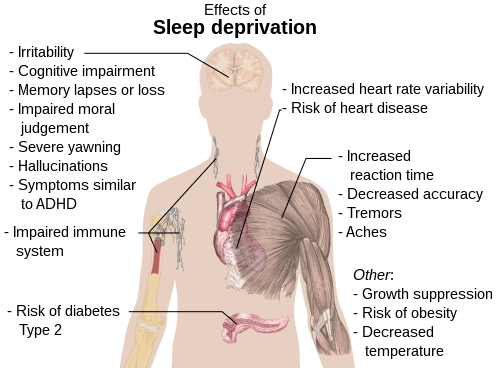 (2010/02/15) Finally a viral cause of chronic fatigue syndrome or not? How results can vary and depend on multiple factors. (2010/04/27) Three studies now refute the presence of xmrv in chronic fatigue syndrome (cfs). Now what did Lo et al exactly do? What were their findings? And in what respect do their findings agree or disagree with the WPI-paper? Like WPI, Lo et al used nested PCR to enable detect XMRV. Nested means that there are two rounds of amplification. 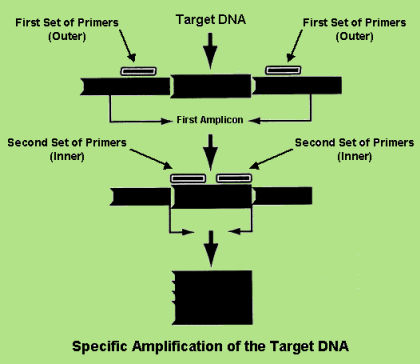 Outer primers are used to amplify the DNA between the two primers used (primers are a kind of very specific anchors fitting a small approximately 20 basepair long piece of DNA). Then a second round is performed with primers fitting a short sequence within the amplified sequence or amplicon. The first amplified gag product is ~730 basepairs long, the second ~410 or ~380 basepairs, depending on the primer sets used: Lo et al used the same set of outer primers as WPI to amplify the gag gene, but the inner gag primers were either those of WPI (410 bp) or a in-house-designed primer set (380 bp). Using the nested PCR approach Lo et al found gag-gene sequences in peripheral blood mononuclear cells (PBMC) in 86.5% of all tested CFS-patients (32/37) and in 96% (!) of the rigorously evaluated CFS-patients (24/25) compared with only 6.8% of the healthy volunteer blood donors (3/44). Half of the patients with gag detected in their PBMC, also had detectable gag in their serum (thus not in the cells). Vice versa, all but one patient with gag-sequences in the plasma also had gag-positive PBMC. Thus these findings are consistent. The gels (Figs 1 and 2) showing the PCR-products in PBMC don’t look pretty, because there are many aspecific bands amplified from human PBMC. These aspecific bands are lacking when plasma is tested (which lacks PBMC). To get the idea. The researchers are trying to amplify a 730 bp long sequence, using primers that are 23 -25 basepairs long, that need to find the needle in the haystack (only 1 in 1000 to 10,000 PBMC may be infected, 1 PBMC contains appr 6*10^9 basepairs). Only the order of A, C, G and T varies! Thus there is a lot of competition of sequences that have a near-fit, but are more preponderant than the true gag-sequences fitting the primers). Therefore, detecting a band with the expected size does not suffice to demonstrate the presence of a particular viral sequence. Lo et al verified whether it were true gag-sequences, by sequencing each band with the appropriate size. All the sequenced amplicons appeared true gag-sequences. What makes there finding particularly strong is that the sequences were not always identical. This was one of the objections against the WPI-findings: they only found the same sequence in all patients (apart from some sequencing errors). Another convincing finding is that the viral sequences could be demonstrated in samples that were taken 2-15 years apart. The more recent sequences had evolved and gained one or more mutations. Exactly what one would expect from a retrovirus. Such findings also make contamination unlikely. The lack of PCR-amplifiable mouse mitochondrial DNA also makes contamination a less likely event (although personally I would be more afraid of contamination by viral amplicons used as a positive control). The negative controls (samples without DNA) were also negative in all cases. The researchers also took all necessary physical precautions to prevent contamination (i.e. the blood samples were prepared at another lab than did the testing, both labs never sequenced similar sequences before). To me the data look quite convincing, although we’re still far from concluding that the virus is integrated in the human genome and infectious. And, of course, mere presence of a viral sequence in CFS patients, does not demonstrate a causal relationship. The authors recognize this and try to tackle this in future experiments. Although the study seems well done, it doesn’t alleviate the confusion raised. 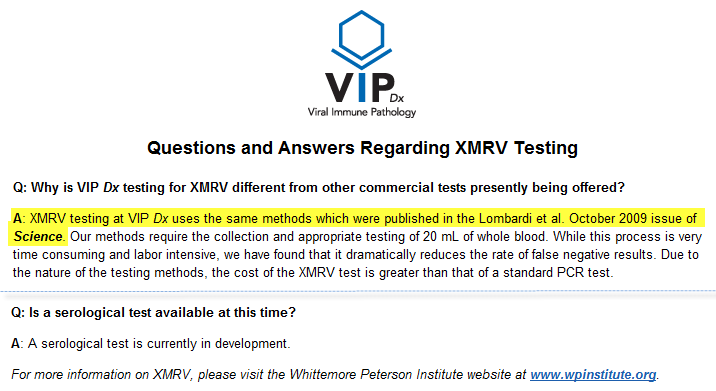 The reason, as said, is that the NIH/FDA researchers didn’t find a single XMRV sequence in any of the samples! Instead a variety of related MLV retrovirus sequences were detected. Sure the two retroviruses belong to a similar “family”. The gag gene sequences share 96.6% homology. However there are essential differences. The main question, this paper raises is why they didn’t find XMRV, like WPI did. In my opinion, the second study is neither a confirmation for, nor a replication of the first. The second study only confirms that WPI is on to something and that there might be an association between a type of retroviruses and ME/CFS. For 10 months all we’ve heard was “it’s XMRV”. If you didn’t find XMRV you were doing something wrong: wrong selection criteria, wrong methods, or wrong attitude. Now comes this new paper which doesn’t find XMRV either and it’s heralded as the long awaited replication and confirmation study. Well, it isn’t! Nice piece of spin by Annette Whittemore and Judy Mikovits from the WPI as you can see in the videos below (… ). WPI may count their blessings that the NIH/FDA/Harvard team looked at other MLVs and found them or otherwise it could have been game over. Well, probably not, but how many negative studies can you take? Assuming the NIH/FDA findings are true, then the key question is not why most experiments were completely negative (there may many reasons why, for one thing they only tested XMRV), but why Lo didn’t find any XMRV amongst the positive CFS patients, and WPI didn’t find any MLV in their positive patient samples. Two US cohorts of CFS patients with mutually exclusive presence of either XMRV or MLV, whereas the rest of the world finds nothing?? I don’t believe it. One would at least expect overlap. My guess is that it must be something in the conditions used. Perhaps the set of primers. As said, Lo used the same external primers as WPI, but varied the internal primers. Sometimes they used those of WPI (GAG-I-F/GAG-I-R ; F=forward, R=reverse) yielding a ~410 basepair product, sometimes their own primers (NP116/NP117), yielding a ~380 basepair product. In the Materials and Methods section Lo et al write “The NP116/NP117 was an in-house–designed primer set based on the highly conserved sequences found in different MLV-like viruses and XMRVs”. …. (GAG-I-F/GAG-I-R (intended to be more XMRV specific) or the primer set NP116/NP117 (highly conserved sequences for XMRV and MLV). Is it possible that the conditions that WPI used were not so suitable for finding MLV? Lets look at Fig. 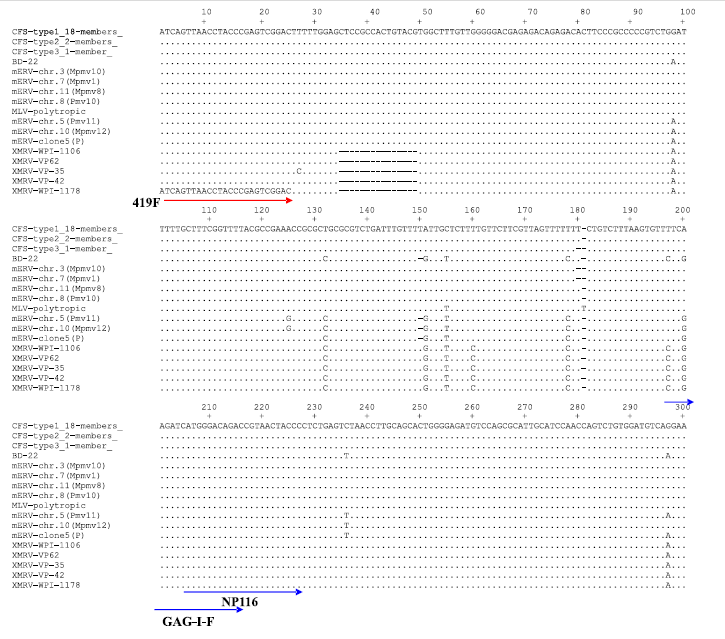 S1 (partly depicted below), showing the multiple sequence alignment of 746 gag nucleotides (nt) amplified from 21 CFS patient samples (3 types) and one blood donor (BD22) [first 4 rows] and their comparison with known MLV (middle rows) and XMRV (last rows) sequences. There is nothing remarkable with the area of the reverse primer (not shown). The external forward primer (–>) fits all sequences (dots mean identical nucleotides). Just next to this primer are 15 nt deletions specific for XMRV (—-), but that isn’t hurdle for the external primers. The internal primers (–>) overlap, but the WPI-internal primer starts earlier, in the region with heterogeneity: here there are two mismatches between MLV- and XMRV-like viruses. In this region the CFS type MLV (nt 196) starts with TTTCA, whereas XMRV sequences all have TCTCG. And yes, the WPI-primers starts as follows: TCTCG. Thus there is a complete match with XMRV, but a 2 bp mismatch with MLV. Such a mismatch might easily explain why WPI (not using very optimal PCR conditions) didn’t find any low frequency MLV-sequences. The specific inner primer designed by the group of Lo and Alter, do fit both sequences, so differences in this region don’t explain the failure of Lo et al to detect XMRV. Perhaps MLV is more abundant and easier to detect? But wait a minute. BD22, a variant detected in normal donor blood does have the XMRV variant sequence in this particular (very small) region. This sequence and the two other sequenced normal donor MLV variants differ form the patient variants, although -according to Lo- both patient and healthy donor variants differ more from XMRV then from each other (Figs 4 and 2s). Using the eyeball test I do see many similarities between XMRV and BD22 though (not only in the above region). The media pay no attention to these differences between patient and healthy control viral sequences, and the different primer sets used. Did no one actually read the paper? Whether theses differences are relevant, depends on whether identical conditions were used for each type of sample. It worries me that Lo says he sometimes uses the WPI inner primer sets and sometimes the other specific set. When is sometimes? It is striking that Fig 1 shows the results from CFS patients done with the specific primers and Fig 2 the results from normal donor blood done with the WPI-primers. Why? Is this the reason they picked up a sequence that fit the WPI-primers (starting with TCTCG)? I don’t like it. I want to know how many times tested samples were positive or negative with either primer set. I not only want to see the PCR results of CFS-plasma (positive in half of the PBMC+ cases), but also of the control plasma. And I want a mix of the patient, normal samples, positive and negative controls on one gel. Everyone doing PCR knows that the signal can differ per PCR and per gel. Furthermore, the second PCR round gives way too much aspecific bands, whereas usually you get rid of those under optimal conditions. Additionally, the CDC laboratory provided 82 samples from their published negative study to FDA, who tested the samples blindly. Initial analysis shows that the FDA test results are generally consistent with CDC, with no XMRV-positive results in the CFS samples CDC provided (34 samples were tested, 31 were negative, 3 were indeterminate). What does this mean? Which inner primers did the FDA use? With the WPI inner primers MLV sequences might just not be found (although there might be other reasons as well, as the less stringent patient criteria). And what to think of the earlier WPI findings? They did find “XMRV” sequences while no one else did. No mention of a positive control. The negative controls were just vials without added DNA. No variation in the sequences detected, a statement that they retracted after the present NIH/FDA publication. What a coincidence. Although the PCR is near the detection limit, only first round products are shown. These are stronger then you would expect them to be after one round. 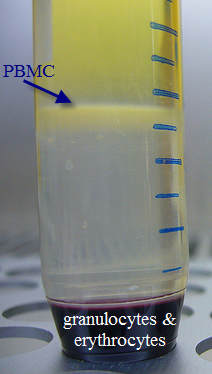 The latter two points are suggestive of contamination. No extra test were undertaken to exclude this. Surprisingly in an open letters/news items (Feb 18), they disclose that culturing PBMC’s is necessary to obtain a positive signal. They refer to the original Science paper, but this paper doesn’t mention the need for culturing at all. At this stage of controversy, the test is sold as “a reliable diagnostic tool“ by a firm with strong ties to WPI. In one such mail Mikovits says: “First of all the current diagnostic testing will define with essentially 100% accuracy! XMRV infected patients”. Their PR machine, ever changing “findings” and anti-scientific attitude are worrying. Read more about at erv here. What we can conclude from this all. I don’t know. I presume that WPI did find “something”, but weren’t cautious, critical and accurate enough in their drive to move forward (hence their often changing statements). I presume that the four negative findings relate to the nature of their samples or the use of the WPI inner primers or both. I assume that the NIH/CDC findings are real, although the actual positive rates might vary depending on conditions used (I would love to see all actual data). No. An exogenous mouse ERV in humans makes no sense. But thats what their tree says. Mouse ERV is even more incredible than XMRV. Might be able to figure this out more if they upload their sequences to genbank. I realize they tried very hard not to contaminate their samples with mouse cells. That doesnt mean mouse DNA isnt in any of their store-bought reagents. There are H2O lanes in the mitochondral gels, but not the MLV gels (Fig 1, Fig 2). Why? Positive and negative controls go on every gel, end of story. First lesson every rotating student in our lab learns. Finding mere virus-like sequences in CFS-patients is not enough. We need more data, more carefully gathered and presented. Not only in CFS patients and controls, but in cohorts of patients with different diseases and controls under controlled conditions. 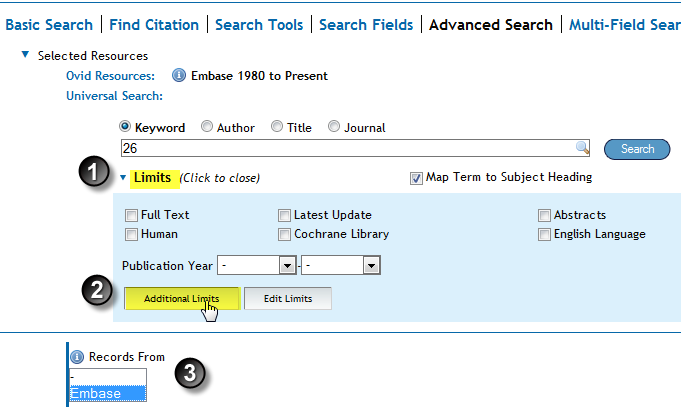 This will tell something about the specificity of the finding for CFS. We also need more information about XMRV infectivity and serology. We also need to find out what being normal healthy and MLV+ means. The research on XMRV/MLV seems to progress with one step forward, two steps back. With the CFS patients, I truly hope that we are walking in the right direction. The Doctors & the Patient. Once there was a woman with secondary Addison’s disease. She took her replacement medicine (cortisol, thyrax, growth hormone, DHEAs) as she should and everything was reasonably under control. However, gradually she began to feel weak. She often disliked food, sometimes to such an extent that she had an urge to vomit. After a month or so, she began to feel dizzy, especially when standing up. Then her heart suddenly banged very quickly against her chest. It felt frightening. Her work wasn’t going well in this period. Feeling weak and not being able to sleep, she could not concentrate and often felt like she could just cry or lay down on the floor, because she was so extremely, extremely tired. But it was a busy and important period. She should write a research proposal, finish a paper, and present a poster at a congress. Furthermore her paper was chosen for a press conference, that was recorded live. Nobody took her serious, no one thought that she might be ill. She did recognize some symptoms that could be manifestations of an Addison crisis (weakness, dislike of food). 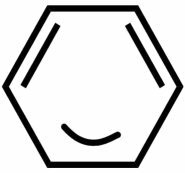 However there was no reason for a crisis: she took all her medicine and had no flu or fever, thus there was no need to raise the cortisol dose. Before she went on vacation she just wanted to check with her endocrinologist, but the endo was on vacation too and according to the policy of the hospital she had to be referred by her GP. Her GP also had vacation, so she went to the locum. He reserved his lunch time for her, which was really nice. Because this doctor wasn’t familiar with the disease, he looked it up in a book and decided to determine whether she had orthostatic hypotension (drop in pressure and dizziness when standing up), because this is typical for an Addison crisis (she learned then). She had to lay down and stand up several times. He failed to demonstrate orthostatic hypotension (but she felt it was taking him too long to measure the blood pressure after standing up; she didn’t say anything though). Then this GP phoned the attending endocrinologist at the hospital. This was one of the endocrinologists who had been in charge of her during the years. Usually she got a new doctor each year. From the conversation she could infer that this endocrinologist didn’t think there was really much wrong. Afterwards the GP urged her to take her medicine (as if she didn’t take enough) and to take more if necessary. He gave her a form for blood tests, but urged her only to do the tests when it was REALLY REALLY REALLY necessary…..
She felt bad, like a show-off. She excused herself, she was sorry to have bothered him. She never did the blood test, but took some extra cortisol though. She went on holidays (why would she stay home? ), but from there it only went worse. She couldn’t sleep at all. She had gradually lost up to 8-10 kilos in 2-3 months time (about 15% of her body weight). She was dizzy and nauseous and regularly had migraine . Her endocrinologist had to convince the internist to make a bed available for admission. During the intake, the two internists behaved very skeptical. Even though the lab results pointed at a too low cortisol level (later confirmed by the lab). One of them kept repeating that a cup of salty soup would pick her up (lack of salt mainly plays a role in patients with primary Addison’s disease, who also lack aldosterone). He would even say that after she recovered by her cortisol infusion. The recovery was very quick. The other internists said that it was a miraculous metamorphosis. Well that female patient? That was me, six years ago. And all doctors were males except the doctor who finally hospitalized me. Yes of all doctors I had seen as an Addison patient over the years, she was the only woman. Many of the male practitioners were excellent doctors, but none of them would have hospitalized me because his intuition told him “something was not o.k.” Maybe I’m wrong and it is just by chance that this happened to be a female doctor. But somehow I feel that, on average (!) female doctors listen a little bit more to their heart, and male doctors a little bit more to their brains. My doctor was not interested in a career as the other doctors, she didn’t like the competition, she didn’t like the hierarchy and she didn’t care for a publication in top journals. Her patients came first. She has now moved to another (non-academic) hospital and I have a new doctor again. A man, indeed. Your post might be about what it’s like to have women patients. Or to be a woman patient, or a woman who’s a health care provider. It could be about trends in health care for women, or how awesome women are, or how annoying they are. It could be about a particular patient who was very ladylike, or someone who totally wasn’t. It’s your choice. Whatever you send, just please make sure it’s related to the Babes in some way, or else I won’t be including you. 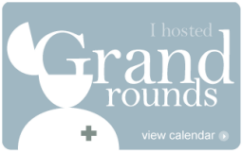 This is Grand Rounds, ChronicBabe-style, so it’s Ladies Choice!